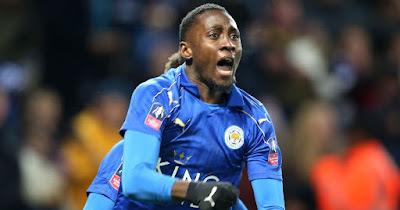 Nigeria midfielder Wilfred Ndidi has been nominated for Leicester City Man of the Match award in Monday’s 3-1 win against Liverpool at the King Power Stadium. According to a four-man list published on Leicester’s official Twitter handle on Tuesday morning, other players in the running are Jamie Vardy, Christian Fuchs and Danny Drinkwater. A brace from Vardy and a goal from Danny Drinkwater secured Leicester’s first win in 2017. Liverpool’s goal was scored by Philippe Coutinho. Ndidi put up a five-star performance in midfield for Leicester who have been on a poor run which led to the sacking of Claudio Ranieri. Ndidi made 11 tackles against Liverpool, a stat only bettered by former Leicester player N’Golo Kante who made 14 tackles (also against Liverpool), the most made in a Premier League match this season. The winner will be announced later on Tuesday evening. With the win, Leicester are now 15th in the league table and two points off the drop zone.